The Northern Ireland pair were given the honour of getting Europe’s defence underway against veteran Jim Furyk and rookie Brandt Snedeker. But despite racing three up with six to play, things almost backfired when they were taken to the last by a gutsy US pair and only just sneaked away with a one up win after Snedeker carved his tee shot 40 yards into the trees at the 18th. There was still drama to come as McDowell bunkered his approach but McIlroy splashed out to seven feet and G-Mac clinched the win with a gutsy putt as the opening foursomes were eventually shared 2-2. It was an emotional day for the Portrush man who had the honour of hitting the opening tee shot and produced a nervy snap hook into the left trees that almost cost them the hole. 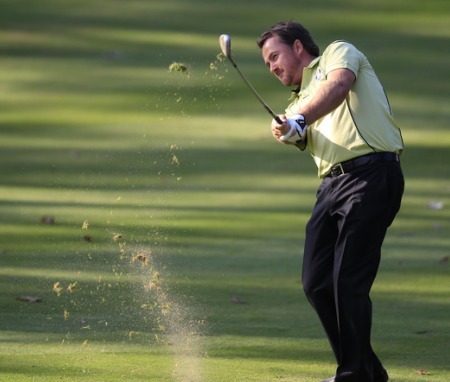 “It was a very bizarre experience,” McDowell said of his drive. After massing cheeers from the 35,000 strong crowd, he was disconcerted when an eerie silence descended. “I was actually feeling very calm and very cool until I stepped over the ball,” McDowell explained. “But I couldn’t ignore the silence. He was all smiles at the end though after holing that clutch seven-footer for the win in a match that was packed with drama from start to finish. “It was a great game today against two really great competitors,” McDowell said. “Jim Furyk played particularly magnificent. He was referring to the brilliant McIlroy, who holed four birdie putts in a row from the fourht to the seventh before McDowell helped build a three up lead after the turn. It was alo crucial win for Europe, who were up in all four matches at one stage before Luke Donald and Sergio Garcia lost their unbeaten foursomes records, going down 4 and 3 to an inspired Keegan Bradley and Phil Mickelson. While Ian Poulter and Justin Rose eventually carved out a 2 and 1 win over Tiger Woods and Steve Stricker, victory for Jason Dufner and Zach Johnson over Lee Westwood and Francesco Molinari by 3 and 2, added to the importance of the McDowell-McIlroy victory. 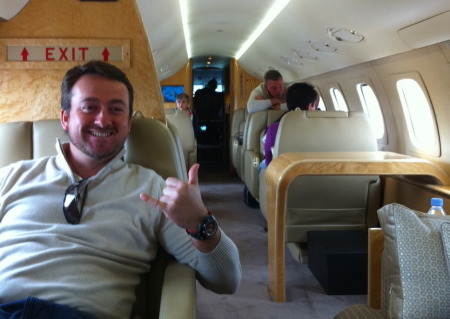 “That match to me just personifies The Ryder Cup,” McDowell said. “Myself and Rory played some great golf to go three up, and then you’re playing against two very gutsy players who clawed their way back to all square coming down the last two holes. “I’m not sure if you’ll play two tougher holes, I mean, the finish to this golf course is very strong and we had stacked our team with this finish in mind. McDowell and McIlroy managed to halve the first in par but lost the second to a par after a lengthy rules dispute. McDowell cheekily sought relief from a sprinkler head that was not interfering with his chip and hoped for a drop that would have allowed him to putt. The walking referee awarded it but Furyk objected and had the decision overturned by the chief referee. 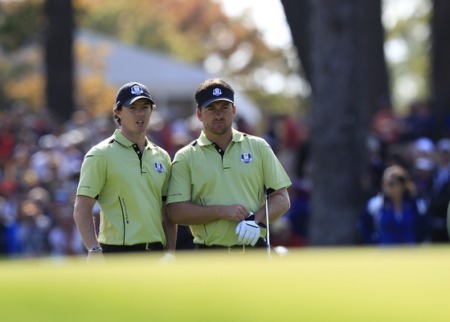 McDowell chipped clumsily and McIlroy missed a six footer for par, leaving the Americans one up. But they slowly clawed their way back, getting back to all square when McIlroy brilliantly chipped in for birdie from behind the fourth green. McIlroy birdied the fifth from 10 feet to remain all square but then edged Europe ahead with a perfect lag putt for birdie at the sixth. The par-five seventh was halved in birdies before Snedeker squared the match with a birdie at the eighth. But it was then McDowell’s turn to shine and he birdied the ninth from 15 feet to edge Europe one up at the turn. American bogeys at the 10th and 11th put them comfortably three up before the momentum shifted. 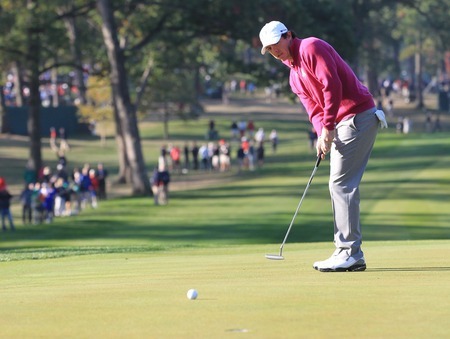 Furyk took the 13th in par as McIlroy chipped clumsily. And while McDowell bravely halved the 14th in birdie, he drove into the water at the driveable 15th, gifting the Americans an easy win. Furyk then squared the match at the 16th with a brilliant approach setting up a four foot birdie chance which his partner holed to reduce square the match. McIlroy chipped dead at the par-three 17th to clinch a half in pars before Snedeker opened the door with that poor tee shot at the last.